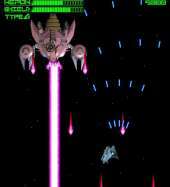 This is a fun Japanese vertical scrolling shoot 'em up game made with Click and Create (CnC) of Europress Software. It offers both horizontal and vertical levels like Philosoma. Our ship moves forward and shoots the enemies from three types of weapons: a laser-firing laser projectile, beating a semicircular wave of the power plant and something interesting, which is not easy to find the name. It releases from the tail of the inclined rays that ricochets from the edges of the screen and hit everything in its path. From time to time, bonuses will rush towards us, mostly restoring the supply of lives, and they need to be caught in time. Opponents regarding other representatives of the genre are not very numerous and too monotonous, but this does not make the game much easier, since its main challenge lies elsewhere. The fact is that the weapon overheats very quickly - and just hold the trigger and fly, sweeping away everything in its path, it will not work. This requires a tactical approach in combination with a good reaction, since the pace cannot be called slow. The game has a couple of drawbacks that significantly reduce its attractiveness - this is instability of work and an unimpressive appearance: the models of opponents are too commonplace, the special effects are quite simple, and the background is completely pitch dark.